I’m always looking for software that can take care of boring tasks for me without intervention. For linux, one can easily hack a cron job with rsync and they’ve got a poor’s man backup in little time. For Windows, things get a little messier. While it’s possible to play with the Task Scheduler, there are simply not that many no-frills backup software that will do straight copies of files to another drive. That, or I just didn’t look hard enough. Lately, I was using Syncback, which played quite nice on my Thinkpad.But it wasn’t perfect. What I wanted was to back up to my external USB2 drive, unless it was disconnected, in which case, it should backup to my 2nd internal HDD on my T40. No go. Enter Tivoli Continuous Data Protection for Files. This software backs up your files as soon as a change is detected. It can backup to a local drive and to a remote drive, for extra protection. In addition, it can also do scheduled backups for given folders/files and will do versioning as well. Now, that’s more like it. And if your company uses TSM, it can even use that as secondary backup. All you need is your userid and TSM’s location. Management is done through a browser-based administration console. Simple, efficient. Else, a small icon in the traybar reminds you that it’s running. 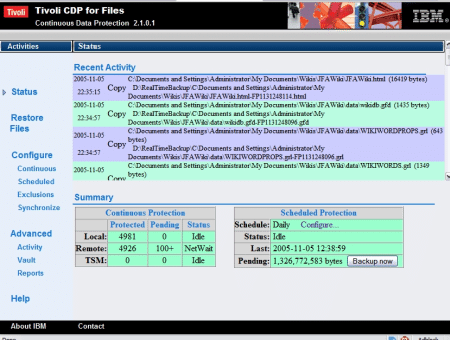 You can get a free trial copy of Tivoli CDP off the IBM website. Check it out! Best of all, files are copied. No proprietary database, no custom format. Copies you can access using Windows Explorer. No client needed. Simple is best. Now, I can sleep knowing I’ve always got backup of my important stuff, on and offline.